In this exclusive ExoNews TV interview series we hear directly from William Tompkins’ about his work for U.S. Naval Intelligence during the Second World War. He reveals that he was directly involved in debriefings by Navy Spies embedded in Nazi Germany’s most advanced aerospace projects – some of which involved antigravity flying saucers that were capable of space flight. 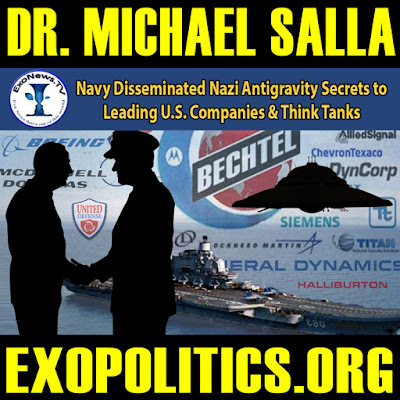 Tompkins describes how from 1942 to 1945, he participated in over a thousand debriefings of U.S. Navy spies, who had been embedded in leading Nazi Germany aerospace corporations involved in building flying saucers. Disseminating this vital intelligence information to various U.S. aerospace corporations and universities was Tompkins primary responsibility. Tompkins said that he served under Admiral Rick Obatta who was in charge of intelligence operations out of the Naval Air Station at San Diego, and three Navy captains who were specialists in different areas of Naval aircraft design, engineering, and procurement. In the interview, he describes some of the circumstances of the debriefings that he participated in. The following interview extract features Tompkins answering questions from Dr. Robert Wood and I on the information he gained from the Navy operatives, the different corporations and thinks tanks he travelled to, and some of the aerospace technologies that were being secretly developed by the Nazis during the War. Tompkins begins the interview by describing the small office where the debriefings of the Navy spies took place at Naval Air Station, San Diego. What follows is the full transcript of William Tompkins responding to questions on the first ExoNews TV episode (see above) presenting his testimony. Published on ExoNews TV – 3/29/16. MS: The following interview extract features [William] Tompkins answering questions from Dr. Robert Wood and I on the information he gained from the Navy operatives, the different corporations and thinks tanks he traveled to, and some of the aerospace technologies that were being secretly developed by the Nazis during the War. Tompkins begins the interview by describing the small office where the debriefings of the Navy spies took place at Naval Air Station, San Diego. WT – We had this little small office. He [Rick Obatta] was commander of Naval Air Station, San Diego and so the admiral would be sitting here. I’m sitting next to him and one of my three captain bosses sitting here. A typist was sitting at the other side of the table and the Navy operative – a Lieutenant Commander or Lieutenant would sit over there. And he would lay out the information [with] some sketches, very few photographs, so it was almost all verbal, almost all. And if it was a system that we had already known about, other operatives from the information two years before, and it was an update of it, he would tie together all of the other organizations that were tied with that specific part, of say the cigar shaped vehicles, what the weapons were, what the operations were, the different companies underneath the ground, which were slave labor organizations. RW – I want to go back to this table where you and Rick [Obatta], the Captain and the Navy spies, sitting at this table, how many times did you get exposed to incidents like that. Was it ten or was it a thousand, like a hundred? It was four years right? WT – I’d say a thousand, maybe 1200. RW – Well that would be like every night for four years. RW – Was it a nightly thing, typically occur day after day? WT – They [Navy operatives] would stay with us for maybe a week, and we tried to put together, better define his information, OK. Then we’d put that together as a package and we’d fly that out. RW – So it would usually be one source would give his story, it might take two or three days for him to give his story, and it would be packaged up, and then you would take it away. RW – What I’m trying to do is grasp the overall scope of those say three or four hundred deliveries you’d make, and some of the stuff had to do with Nazi history. Did some of the scope have to with, for example, age regression, Nazi age regression, as well as Nazi UFOs? RW – I’m talking about what the Nazis were doing in a military mode. WT – Yes, it went to weapons systems, all types of advanced weapons systems, all types of methods of war. RW – Did you get exposed to the Hanebu craft designs, or anything like that during that time? WT – I was involved in making sketches of some of the stuff that was actually there. MS – Did you ever come across the term ‘Hanebu’ as a description for various models of German antigravity vehicles? WT – Yes, but remember the stuff that we got … the wording was in English, some of the documents that we got were of course in German. But we didn’t get so much of the documents. It was mostly verbal, and it was saying, in his interpretation, that was another thing, because we had one of the guys to go check so and so, “I want you back over there, and I want you back here next month.” Then there’s updates to the information. And so some of the stuff that was in German, we had another group of people convert it into English. So you are working with information that you don’t have background on, and so what you are trying to do is put enough of it together so that [for example] Lockheed could take that information, and develop it, interpret it and come up with something that could possibly be used. When I said that many, remember that I went back to these facilities, sometimes six or seven times with updated information that we got. Because three years after they said it before, we got things now, it’s been developed. Now it’s this, this and this. RW – So do you remember what kind of material you took to different places, JPL or Caltech as it was called then? At JPL would you take the material relevant to UFO craft or antigravity craft? WT – Everything about propulsion, the different types of propulsion and the stuff, I had no idea what this was… Then controls, different types of controls, support systems. Almost any subject, any question you wanted to ask. Some of that information we were getting. RW – Some of the groups didn’t get everything. RW – So if there were six locations, Douglas, Caltech, MIT, is that right? RW – And then Lockheed? WT – Lockheed, Boeing, North American, Northrup, North American. RW – So there were seven or eight different locations that you made deliveries to? Some of them that I went to, they wouldn’t let me disseminate the information, they were not interested. They didn’t want to have a thing to do with it. And I had that with several universities who were doing military programs. RW: Was Purdue one of them? WT – Yes, Purdue was one…. What I’m saying is that not everyone was willing to help the Navy. MS – What about the Air Force? Like Wright Patterson? WT – Yes, Wright Patterson … A couple of the admirals didn’t want that, but we had our list of who we thought could help. The point is that these went not document after document you gave them. You gave them information that was verbal almost, very little photographs, very little drawings of a specific part of the propulsion, or a method of control … of these things. WT – All technical stuff. I don’t mind talking about this because frankly I lived that thing for four years. It was staggering. The German titles or stuff was a problem, so we had interpreters there that would help us put the packages together to say to take to Douglas, OK? And so there’s the misinterpretations and stuff, that I’m right. All that’s part of it. You don’t get some nice good package, and so packages were taken to places that were insufficient information. So they would get all … upset with me. I’ve got to go get this and that. RW – Even though you were not trained technically as an engineer or a scientist, you were exposed to technical information in this process. It’s usually put in terms of common language and common sense. So you understood it? WT – I understood some of it. Some of it I had no idea what he was talking about, and I have to tell him that, you know.